The Census Bureau has implemented a large outreach effort aimed at the Hispanic community, especially Spanish speakers, to encourage them to participate in the 2010 Census. It spent more than $25 million on these ads, representing one-in-five (20%) ad dollars planned for the 2010 Census.1 In conjunction with this effort, many Hispanic media and nonprofit organizations mounted 2010 Census awareness efforts—some of them in partnership with the bureau, and some independent of the bureau. Overall, these efforts appear to have reached a large share of the Hispanic community. Nearly half (48%) of all Latinos say they have seen or heard something from an organization encouraging them to fill out their census form. This is particularly true of the foreign born and those who are bilingual or are Spanish dominant. More than half (56%) of foreign-born Hispanics say they have seen or heard something encouraging them to participate in the census; just 38% of the native born say the same. 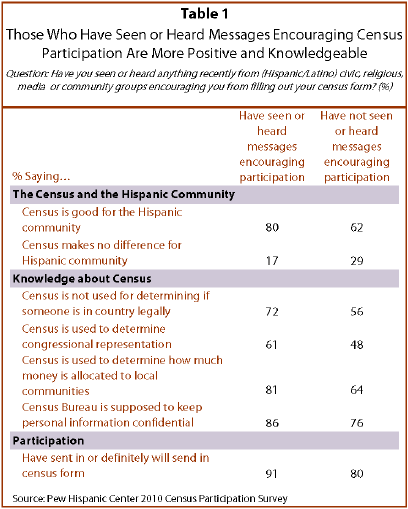 And nearly half of bilingual Hispanics (47%) and 57% of Spanish-dominant Hispanics say they have seen something recently encouraging them to participate in the census, while less than three-in-ten (29%) English-dominant Hispanics say they recently have seen or heard something. Those who have heard or seen messages are more positive about the census than are those who have not heard or seen messages. Eight-in-ten (80%) Latinos who have seen or heard a message say the census is good for the Latino community, while 62% of those who have not seen or heard messages say the same. Those who say they were exposed to messages encouraging participation are also more knowledgeable about the uses of the census than are those who were not exposed to messages encouraging participation. 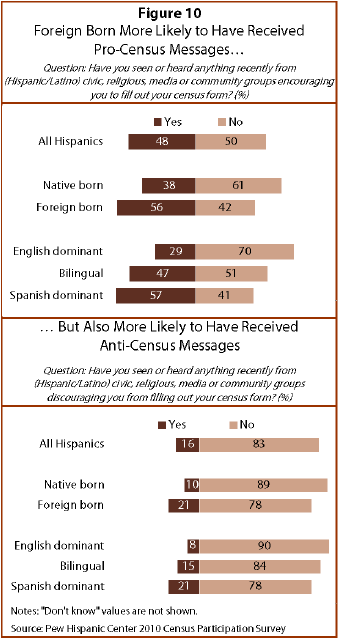 For example, more than seven-in-ten (72%) Latinos who were exposed to encouraging messages say the census is not used to determine if someone is in the country legally. In contrast, 56% of those who say they were not exposed to messages encouraging participation say the same. Seeing a message is also related to census participation. Nine-in-ten (91%) Latinos who say they have seen or heard a message encouraging participation in the census say they have either sent in their form or definitely will send in their form. Among those who have not seen messages, 80% say they have sent in their form or definitely will. Concurrent with an outreach effort to encourage Hispanic participation in the 2010 Census, there have been efforts by some Latino leaders aimed at discouraging Latinos from participating. Overall, few Latinos say they have seen or heard messages discouraging them from participating in the 2010 Census—just one-in-six (16%) say this. Foreign-born Hispanics are more likely than native-born Hispanics to say they have seen or heard something discouraging them from sending in their 2010 Census form—21% versus 10%.